Drawing from our heritage from one of the most famous designs in offshore history, the 41’ Apache® has been recreated into the all-new 42’ Apache® Renegade. The stand-up 5-person cockpit and staggered engines allow high-speed acceleration through adverse sea conditions. 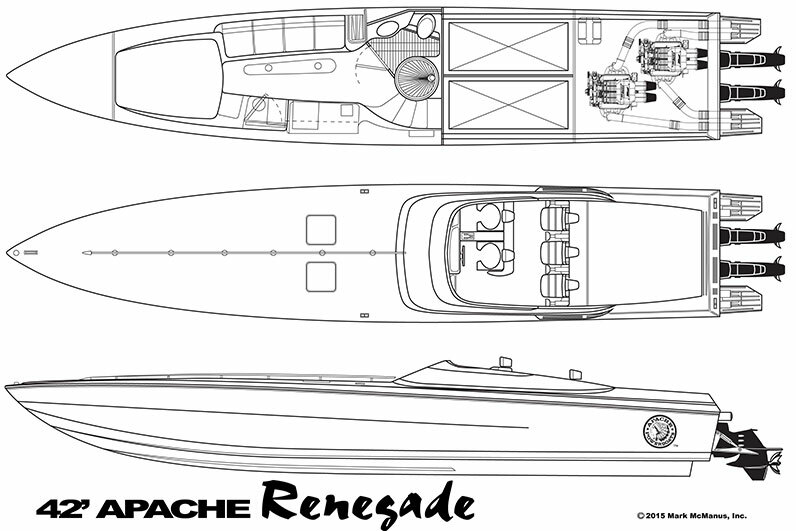 The Apache® Renegade has a centerline helm position and a choice of engine hatch configurations. 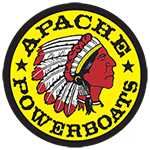 With a full cabin, the Apache® Renegade is a very versatile boat, perfect for overnight excursions, winning poker hands and island hopping. A variety of engine options can easily propel the Renegade into triple digit speeds. The Kevlar and carbon laminates assure a safe, secure ride in a 25 year lifespan through thousands of miles of adventures. 700 HP with Dry sump M-6 out drives. 1100 HP Twin Turbo with Dry sump M-8 out drives. 1350 HP Twin Turbo with Dry sump M-8 out drives.